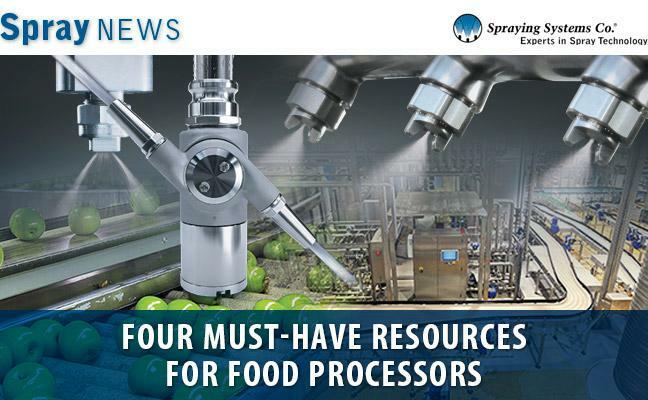 If you’re involved with food safety, applying coatings to products and/or equipment, plant sanitation or spray drying milk, flavorings or other ingredients, take a few moments and learn about new technology that can help optimize your operations. We offer a wide range of reference guides that contain valuable information on how to improve quality, minimize waste and boost production time in dozens of operations – cooling, cleaning, coating, lubricating, drying sealing and more. Start by updating your reference files and then give us a call. We’re standing by and ready to help you implement changes in your plant to improve efficiency. If you need to moisten products prior to further processing, apply oil on pans or conveyors, coat products with butter, glazes, egg wash or other viscous coatings, be sure to learn about our AutoJet® Precision Spray Control Systems. These systems ensure the solution is applied precisely and uniformly on the the target with minimal waste. Looking for ways to protect foods from pathogens, achieve clean labels and extend shelf life? Need a better method to sanitize conveyors? Our AutoJet Antimicrobial and Mold Inhibitor Spray Systems can help you achieve those goals for meats, poultry and baked goods. If have have quality or bulk density problems caused by inconsistent particle size, be sure to review our new SprayDry® nozzle catalog. It includes information on a variety of SprayDry nozzles that can consistently produce the exact particle size you need. Looking to reduce cleaning time without compromising cleaning quality? You’ll find dozens of tank cleaning nozzles and machines for vats, mixers, totes, blenders, barrels and more in our TankJet® line. Cleaning equipment and floors? Start by reviewing our GunJet® spray gun line for more information on our wide range of low-, medium- and high-pressure spray guns. Spraying Systems Co. is global leader in spray technology. It has the broadest product range in the industry, ten manufacturing facilities and sales offices in more than 85 countries. Spray nozzles, turnkey spray systems, custom fabrication and research/testing services comprise the 76-year-old company’s offering. More information is available at www.spray.co.za or https://www.multi-lube.com by contacting the company directly at 011 618 3860 or by email grant@monitorspray.co.za.